Many Ortho­dox Chris­tians who dili­gent­ly attend the ser­vices of the Holy Week can recall the beau­ti­ful and mov­ing canon ded­i­cat­ed to the Lamen­ta­tion of the Most Holy Theotokos, read at Small Com­pline fol­low­ing the Ves­pers of Holy Fri­day. In this hymno­graph­ic com­po­si­tion, chant­ed in front of the epi­taphion — an embroi­dered icon of Christ placed in the Tomb — the Most Holy Moth­er of God laments the cru­ci­fix­ion of her Divine Son and reflects upon the mys­tery of the death and bur­ial of Christ, the Author of life, the Cre­ator of heav­en and earth. The canon assigned for the Small Com­pline of Holy Fri­day in the cur­rent Slavon­ic edi­tions of the Lenten Tri­o­di­on is attrib­uted in the man­u­scripts and print­ed edi­tions either to Patri­arch Nicholas I Mys­tikos (852- 925) or, as in the Slavon­ic Tri­o­di­on, to St Syme­on Metaphrastes (10th cent. ).1See Nan­cy Pat­ter­son Ševčenko, “The Ser­vice of the Virgin’s Lament Revis­it­ed,” in ed. Leslie Brubak­er and Mary Cun­ning­ham, The Cult of the Moth­er of God in Byzan­tium: Texts and Images (Burling­ton, VT: Ash­gate, 2011), 247–262, here 247–8. There is, how­ev­er, anoth­er canon ded­i­cat­ed to the same theme, which was nev­er includ­ed in the print­ed edi­tions of the Tri­o­di­on. This canon, also bear­ing the inscrip­tion “[For the] Lamen­ta­tion (Thrênos) of the Theotokos,” appears in no less than sev­en man­u­scripts, dat­ing between the 11th and the 15th cen­tu­ry. It is also attrib­uted to the same St Syme­on Metaphrastes, even though one source gives a cer­tain Theo­phanes as its author. The man­u­script sources dif­fer with regards to the exact litur­gi­cal con­text for this canon: some assign this for the Com­pline of Holy Fri­day, while some — to the evening or the Com­pline on Holy Sat­ur­day, pre­sum­ably mean­ing the Paschal mid­night office, cel­e­brat­ed today just before the Paschal pro­ces­sion. This pre­lim­i­nary, uncor­rect­ed trans­la­tion from the orig­i­nal Greek fol­lows the ear­li­est man­u­script ver­sion that was pos­si­ble to find, name­ly the Tri­o­di­on ms. Sinai Greek O.742 (1099 AD), folia 180–183. Even though the text of this canon accord­ing to the lat­er Greek man­u­scripts has already been pub­lished2Paul Canart, “Le Vat­i­canus gr. 1072 (+ Vat. gr. 2296, ff. 1–8), un theotokar­i­on daté de 1301,” Bol­let­ti­no del­la Badia Gre­ca di Grotta­fer­ra­ta n.s. 47 (1993): 5–41, 33; “Un’ufficiatura per­du­ta del Ven­er­di San­to,” Roma e l’Oriente 5 (1913): 302–313., this ear­li­est man­u­script wit­ness has not yet been pub­lished or includ­ed in the pre­vi­ous crit­i­cal edi­tions. 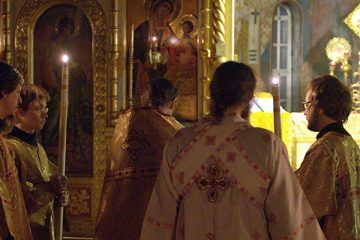 On the Holy and Great Saturday, the Canon, sung in place of the Compline, for the Divine Burial of our Lord, God and Saviour Jesus Christ, and for the Lamentation of our most holy Lady Theotokos. Ode 1, pla­gal of the 2nd tone. 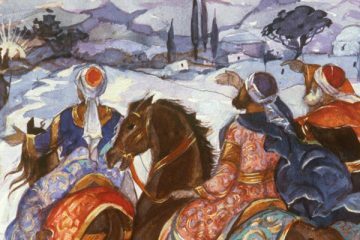 He who in ancient times…4The heir­moi of the odes 1, 3, 4, 6–9 were tak­en from the Canon of the Matins of Holy Sat­ur­day, tone 6, begin­ning Kymati tha­lassês… (Slav. Волною морскою), which may show that the posi­tion of the canon here was the ‘mid­night office’ between the litur­gy of the Holy Sat­ur­day and Paschal Matins. The trans­la­tion of the begin­nings of the heir­moi of the canon is tak­en from Moth­er Mary, Archi­man­drite Kallis­tos Ware, trans. The Lenten Tri­o­di­on (South Canaan, PA: St Tikhon’s Sem­i­nary Press, 2002), 593, 646- 651. 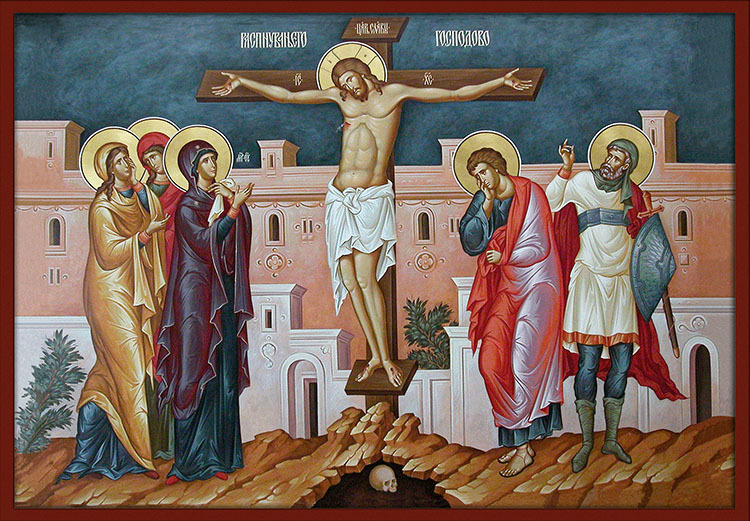 Will­ing to give Thy life for Thy cre­ation, O my Sav­iour, Thou wast sus­pend­ed on the Cross and wound­ed by the spear, but Thy spot­less Moth­er, stand­ing before Thee, was deeply trou­bled, O Mas­ter, behold­ing the well­springs of Thy blood. Hav­ing inclined Thy divine neck, O my Sav­iour, Thou hast slept with a life-giv­ing sleep upon the Tree, but all of cre­ation is trou­bled and the heav­en­ly ranks of Angels are shak­en, see­ing Thee suf­fer­ing in the flesh. Most swift­ly and secret­ly did Thy Moth­er approach Joseph, Thy secret dis­ci­ple, and lament­ing mys­ti­cal­ly, she begged him to request Thy pure body from Pilate, the law­less judge. “Be gra­cious, O Joseph, to the Stranger who stands speech­less­ly before me and is pushed by the law­less ones, aban­doned by friends and acquain­tances, as I am lament­ing togeth­er with only one dis­ci­ple.5The Beloved Dis­ci­ple, tra­di­tion­al­ly iden­ti­fied with St John the The­olo­gian, who stood with the Theotokos by the Cross (John 19:26). 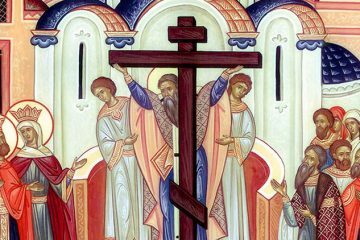 No one dares to peti­tion for the pure Body of the Teacher, dead and hung upon the Cross, naked, marked and cov­ered with insults, unanoint­ed, but rather deeply wound­ed in its side. O my Christ, as Joseph saw Thy Moth­er cry­ing and heard her words, he felt the pain of sym­pa­thy and also raised the lament, and quick­ly rushed to ask for Thy pure Body. Giv­ing assent to the plead­ing, Pilate grants Thy divine Body, and tak­ing it from the Cross with Nicode­mus, Joseph made it to recline in the grave, and the earth trem­bled and hasti­ly gave back the dead out of the tombs. Embrac­ing also Thy knees, the Birth­giv­er placed her arms around them, lament­ing – she kiss­es Thy hands and Thy side, which are still drip­ping with thy divine Blood, O Mas­ter. Ode 5. I seek thee ear­ly in the morn­ing…6The eir­mos of the 5th ode, begin­ning Pros se orth­rizô… (Slav. Къ тебѣ утреннюю), has been appro­pri­at­ed from the Canon of the Matins of Holy Fri­day. “How didst thou, O Peter, deny the Sav­iour9Mt. 26:69–75, whom thou didst con­fess to be Christ, the Son of the liv­ing God10Mt. 16:16, and how didst thou aban­don Him alone cru­ci­fied on the Cross, hav­ing nei­ther breath nor coun­te­nance11Cf. Isa­iah 52:3., and didst not has­ten swift­ly to low­er his Body into the tomb?” saith the Unde­filed one in her moth­er­ly lamen­ta­tion. The hosts of angels, gaz­ing from the heav­ens, were in fear see­ing as dead in his Mother’s lap the One before Whom they stand trem­bling and Whom they behold as being in the bosom of the Father and rais­ing the dead from Hades.12It is pos­si­ble to see here an allu­sion to the first of the Res­ur­rec­tion­al troparia (Evlog­i­taria) sung at Sun­day Matins before the read­ing of the Res­ur­rec­tion­al Gospel: “The assem­bly of Angels was amazed…”. All the ranks of angels above and below hur­ried, shak­ing in agi­ta­tion, to behold the Body of Christ breath­less, lying in His Mother’s lap, and seized with amaze­ment and astound­ed they turned back in fear. O Christ, who shall lament Thy strik­ing, scourg­ing, mock­ing, and spit­ting, Thy cru­ci­fix­ion, the crown of thorns, gall and vine­gar, and the pierc­ing of the side? How shall I lament thee, O Son, Who art dead in the tomb?13This tropar­i­on is found in some, but not all, man­u­scripts con­tain­ing the text of this Canon. Dr Vitaly Per­mi­akov is Assis­tant Pro­fes­sor of Dog­mat­ic and Litur­gi­cal The­ol­o­gy at Holy Trin­i­ty Sem­i­nary and man­ag­ing edi­tor of the Holy Trin­i­ty Sem­i­nary Press. He holds a Ph.D. from the Uni­ver­si­ty of Notre Dame. His research spe­cial­ty is in the ancient litur­gi­cal rites of the Church of Jerusalem.